In Predicting the Markets, Edward Yardeni, Wall Street’s legendary economist and investment strategist, shares his insights and lessons learned forecasting the economy and financial markets over the past 40 years. Ed Yardeni takes readers on a fascinating journey retracing the economic and financial ups and downs from the late 1970s through today. Along the way, he mines the lessons of the past for insights that inform how to be thinking about the future. “Dr. Ed” was among the first Wall Street prognosticators to see the bullish consequences of disinflation and globalization for stocks and bonds during the 1980s and 1990s. He was the first economist on Wall Street to recognize the importance of Baby Boom demographic trends. In 1993, he started writing about the “High-Tech Revolution in the US of @”—presaging the enormous impact that technological advances would have on life today. After China joined the World Trade Organization in 2001, he foresaw the resulting commodity boom. Dr. Ed turned bearish on financial services stocks during June 2007 before the financial crisis hit with full force. Although he wasn’t bearish enough on the overall stock market back then, he correctly called the market’s bottom the week after it was hit in March 2009, remaining steadfastly bullish during the nine-year bull run through the start of 2018. In Predicting the Markets, Dr. Ed explains his reasoning behind all these predictions. He also explores why so many conventional forecasting models have been so frequently wrong. His approach is based on common sense rather than complicated and often misguided theories. 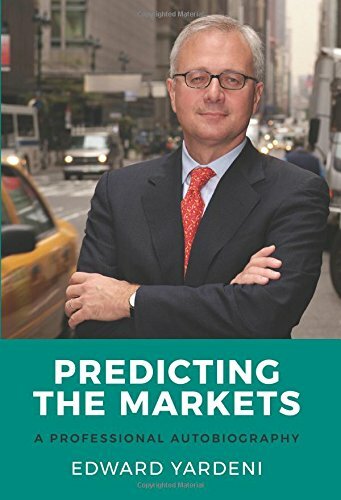 He demystifies what can often seem like a complex tangle of countervailing forces impacting financial markets and provides a highly engaging how-to guidebook for profiting from outside-the-box thinking, while avoiding the groupthink of consensus forecasting. Yet Dr. Ed’s book can be read by anyone with an interest in financial markets and economics; no prior knowledge is necessary. All the major issues that investors must sort through as they navigate financial markets are explained in a clear and logical way. Dr. Ed believes everyone can benefit from a better understanding of the forces that shape our financial lives. Accordingly, Predicting the Markets is chock-full of important lessons not only for institutional investors but also for individual investors, as well as business professionals and students. When it comes to predicting the global economy and financial markets, Dr. Ed has literally written the book. If you have any questions about this product by YRI Press, contact us by completing and submitting the form below. If you are looking for a specif part number, please include it with your message.